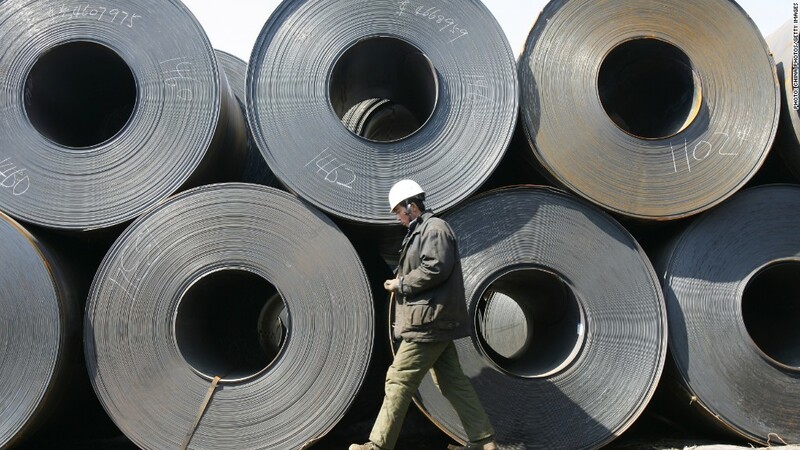 Experts say China's energy and resources sector, including steel, cement, solar and wind, is most at risk of defaults. China looks ready to let more companies go to the wall as part of its economic reforms, shaking financial markets that are used to the government bailing out firms at the last minute. Corporate defaults will be unavoidable in the future, Premier Li Keqiang said this week. The message that the government won't always ride to the rescue has weighed on Chinese markets -- the Shanghai Composite ended the week down 2.7% and Hong Kong's Hang Seng fell 5%. Li's comments came just days after China experienced its first such default, when a small Chinese solar firm failed to make an interest payment to investors. Jefferies analyst Ming Tan called this the government's "small test case and warning shot" to assess the market impact. Experts say more corporate defaults and bankruptcies are on their way, and could serve as a call to borrowers and lenders to be more responsible. Over time, it could help slow the rapid growth in Chinese debt, which threatens to spiral out of control. But letting more companies fail is fraught with risk, as it could also slow China's economy and undermine social stability. A series of defaults could create market turmoil and anger investors who have been promised gains. Copper prices have already fallen sharply on fears that stocks of the metal used to finance company borrowing may have to be sold to pay off debts. "We think it is increasingly recognized by markets, as well as regulators, that China needs real credit defaults...to develop a healthy credit market," wrote Barclays economist Jian Chang in a research note. But "the government faces tremendous challenges to push for reform and prevent a financial crisis." Many firms have borrowed to the hilt in recent years, as China encouraged banks to lend to companies in efforts to beat the global economic crisis. Some firms have issued bonds, while others, unable to secure traditional bank loans, have turned to risky solutions in China's unregulated shadow banking world. Borrowing on all fronts has ballooned to a point where some companies are facing financial stress -- particularly as China's overall economy slows down. And lending has been criticized as wasteful and inefficient. "Financial risk is much heightened after another year of rapid credit growth," said Societe Generale economist Wei Yao. All this comes on top of many other reforms Li has set out, including loosening currency controls, clamping down on shadow banking, and fighting pollution. Whether China does allow more defaults remains to be seen, and may depend on the health of the economy. The government wants to ensure stable growth, and has set a goal of expanding the economy by 7.5% this year. Societe Generale's Yao said Li had set himself a "mission impossible to achieve each and every task outlined...without compromising on the growth target."